About 10 years, I decided I was going to learn how to crochet. I looked all over the internet for resources to help me out and over time, I gradually pieced together the basics and figured it out. But it took me a long time to understand some of the simple aspects of crochet just because I was learning from so many different sources that all explained things a little differently. There had to be a better was to teach crochet for beginners like me! As much as I looked, I could find a definitive resource that could take you from absolute beginner to “oh my God! I crochet!”. So I created one myself and called it The Beginner’s Guide to Crochet. What is The Beginner’s Guide to Crochet? If you’ve ever looked at something crocheted and thought, “I wish I could make that!” but just didn’t know where to start, this is the ebook for you. Or maybe you learned the basics from your mother, grandmother or family friend, but you need a little refresher. Whatever the case, The Beginner’s Guide to Crochet is a full course to teach crochet for beginners from the very basics to skills and techniques that grow with you. As someone who had to learn crochet on my own, I know that it can be tricky to make sense of all the stitches and funny new hand motions while trying not to get your yarn all tangled. I’ve been there and now I’m a crochet designer teaching others how to crochet and guess what, I’m actually making an income from it! Crochet has taken me a long way, but we all start in the same place and this is the one resource I wish I had when I looked up “crochet for beginners” almost 10 years ago. The 63-page ebook is a FULL COURSE to teach you how to crochet and it includes all the resources you need! Here’s a sneak peek at everything included in the ebook. Each lesson includes a written description of what to do, pictures showing you each step and how it should look AND a video tutorial that you can follow along with! So no matter what you’re learning style is, this ebook has you covered. To help you practice your new skills and learn how to read patterns at the same time, there are also 12 patterns that are simple, fun, and perfect crochet for beginners to make quickly and easily. Each pattern has pictures of the finished project, step by step photos and a video to show you how to make it! Plus, there’s a variety of things to make so you can see what you enjoy crocheting the most. Okay, so how do you actually get a copy of this amazing resource?? Easy! Just sign up using the box below and you’ll get the ebook delivered right to your inbox. You’ll also be signed up for the newsletter I send out every week with free crochet patterns, more resources, tips, and yarn deals that you don’t want to miss! 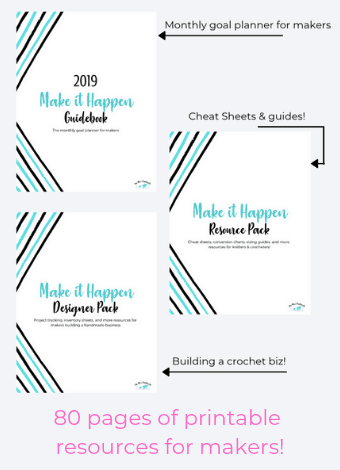 PLUS, because I love freebies and I know you do too, you’ll get access to my resource library with more freebies and cheat sheets to help you with your crochet adventures! And it’s all for free. 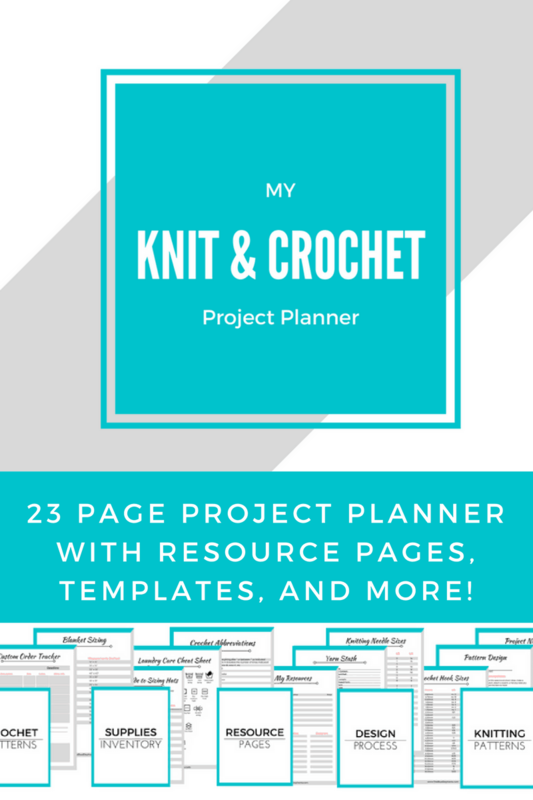 Before I sign off, I have a few more resources you might find handy, whether you’re a beginner or a seasoned pro at crocheting. 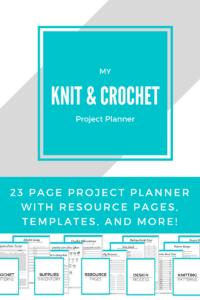 My Knit & Crochet Printable Planner! And that’s all for today! You’re here because you’re interested in crochet, so get the ebook and start practicing. There’s nothing stopping you or holding you back, and if you have any questions or need some clarification, just leave me a comment down below. I’ll do my best to help you out. Learning to crochet really has changed my life, and I know that sounds dramatic but it has. I get to work from home and spend my time making fun things. Even before I got to that point, crochet was such an amazing creative outlet and it let me share something with people I love. I think everyone needs a hobby or outlet like that, so why not crochet? Thanks for reading. If you get the ebook, please share this post on social media! Looking for your easy, messy bun beanie! Sorry, Bonnie, but there is no bun beanie right now! I’m not sure where you saw one, but unfortunately there isn’t on here yet! I know what you mean. My list of projects goes on and on, and it’s so hard to decide what to focus on sometimes! The ebook is always here and always free, though, so come back whenever! Thanks for sharing with us at Sweet Inspiration too, I am sure there are lots of people who can take advantage of it. Hope you have a lovely weekend, Shehla! Thanks, Christina! There's tons in there, but if you ever need any help, feel free to reach out to me! Wow! This is impressive. I have been dabbling in crochet but could definitely use more direction. I look forward to checking this out. Will pin and share as well. Thanks, Keri! I had to look all over the internet when I was trying to teach myself to crochet a few years ago and I wished for something cohesive I could use. Thank you so much for sharing! Shehla, this is a great resource for people wanting to crochet. I'm sure this must have taken a lot of hard work to put together. My aunt taught me to crochet when I was 14 and I have enjoyed it ever since. 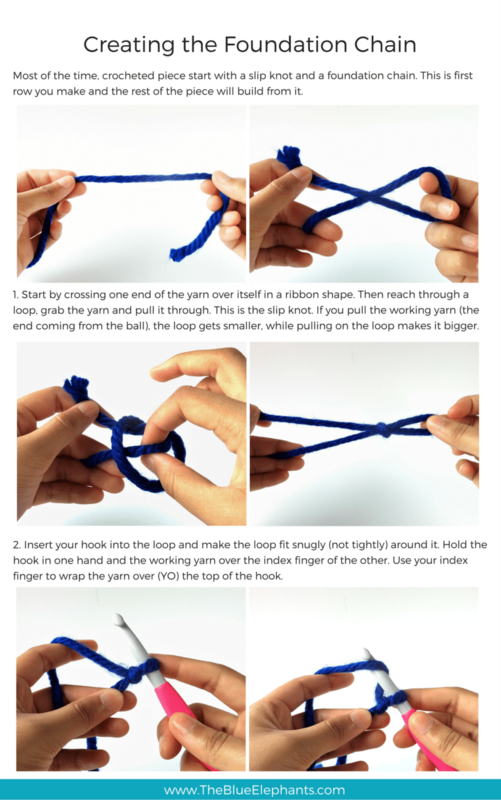 I'll pin this to help share the word, so others can learn the fun and relaxing art of crochet. Thanks for sharing at Sweet Inspiration! How neat! I so need to learn this craft! I love to crochet and those booties are adorable! Thanks for dropping your post at From the Archives Friday link party! Love the amount of pretty things that can be done with crochet… I think I need to learn! I would love if you share this with us at the party we host each Tuesday, which is called Two Uses Tuesday.